We intend to create reliable infrastructure to provide insurance protection for crypto assets. Unique insurance product to cover losses of users in case of crypto-exchange failing. 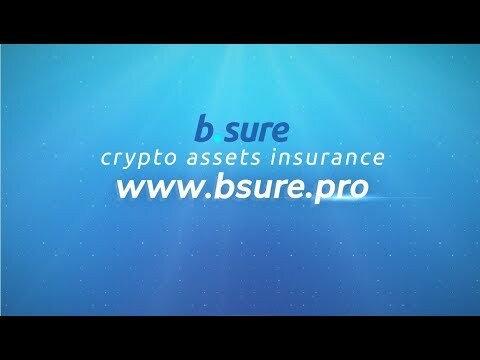 The implementation of the B.Sure project implies the systematic intriduction of this technology into the insurance market. Most crypto projects, which are now represented on the insurance market or plan to enter it in the near future, only partially use all the opportunities provided by modern technologies. Our team combines years of experience in the insurance ,arket, readiness for innovation and a strategic vision of the huge potantial for the development of technologies such as blockchain, machine learning and neutral networks. The huge potential of the blockchain technology development is not realized in the insurance industry. We willl become the centre of expertise in the crypto market a variety of products and apply a modern methodology of risk assessment. The founders come up with the idea of creating an insurance company in crypto-investment market. Project founders from the first version of Whitepaper. PArtnering up with the crypto-consulting company 101co.in. New specialists in blockchain, technologies, marketing and analytics were intergrated into the b.sure company. A stable tokenization method was developed. Kick-start of the private Pre-Sale stage of the project and full preparation for ICO. An agreement reached with rating agency DIGRATE about co-development for insuring ICO risk investors in 2020. Development of smart contracts for an insurance product against crypto exchange failure. Launch of the insurance product against crypto exchange failure. Signing first contracts with crypto exchanges for selling b.sure policies to crypto exchange customers. Co-launch of a product for ICO investitions insurance with Digrate. Launch of a product for personal crypro assets insurance against cyber attacks. Development and launch of other prospective and useful products.